I was part of a great workshop earlier this year and the writer in residence, Mia Gallagher, was brilliant. Throughout the course she gave me a lot of advice and feedback and then some more... some of which I didn't really want to hear. You know when you think what you've written is perfect just the way it is. In this case ignorance was bliss. I was sailing along thinking everything was great and then suddenly this huge wave comes along, smacks right into me, disorientates me for a few minutes. But I got through it, carried on, forgot about the wobble and what caused it. Then smack another one, then another, they kept coming stronger and faster till I was in the middle of a storm of doubt and fear. Till my boat was creaking and groaning under the strain. I wanted to give up then and there, cover my head, pretend I didn't care. But the more I ignored the storm swirling around me the worse it got and the worst I felt. It's hard to hear the truth sometimes, harder still to get back up, change things and start again. But once I took that first step every step after that was a little easier. So I jettisoned a lot of words and a dear character, I've changed a few essentials in my story, patched up the boat. 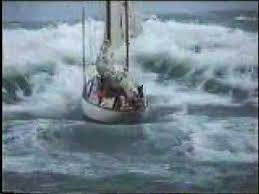 I've gotten through this storm, am sailing onwards again and my story is all the better for it. No doubt there'll be more storms ahead. But as Franklin D. Roosevelt so brilliantly said 'A smooth sea never made a skillful sailor.' I'm not sure I'll be looking forward to the storms ahead or will be ready for the next one when it comes but now I know what to do. I'll learn from it. I'll get stronger. I'll get better and I'll keep sailing forward. So here's to the challenges and the bumpy roads and the stormy seas, may each one make you a more skilful sailor.